Chocolate exfoliation: This treatment incorporates the anti-depressive properties of chocolate in addition to skin-purifying serotonin. Silk exfoliation: For all skin-types that need to re-moisturize, ideal for giving your body a fresh, natural glow. Grand Rose exfoliation: A luxurious exfoliation treatment that removes dead skin-cells from the body and face, creating a smooth skin tone along with the unforgettable fragrance of roses. Reflexology: The ancient oriental technique of utilizing pressure points is focused on specific areas of the feet and hands that correspond with major organs, glands and parts of the body. Shiatsu massage: A traditional Japanese therapy, this massage uses pressure from the thumb and palm on specific points along the acupuncture meridians, stimulating the body's own energies. Cleaning facial: A classic European facial designed for deep skin cleansing, helping to remove dead skin-cells and impurities. Teotihuacan body treatment: This detoxifying treatment removes impurities and water retained in the skin, improving the body's appearance. 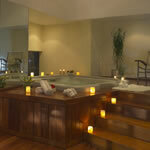 Hydro-therapy: Experience complete vitality and absolute relaxation through the properties of water. 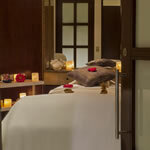 Enjoy a hydro-massage with natural aromatic essences extracted from the most exotic plant and vegetable extracts.